In 2006, I went on a road trip and…well, I had a little coma. Bradley was on the trip with me and bore the initial traumadrama. My family and friends traveled to be with me in Georgia. My brother sat at my bedside for seven weeks. My daughter was in her last year of college, traveled back and forth…and still got straight A’s. I think she was in a “walking coma” of sorts at that time. My friend, Shannon, brought me “back from the dead” literally and Susan gave me a mantra that kept me alive. Larry got a plane, pilot and nurses to get me back to K.C. John is an interpreter at St. Luke’s and checked on me every day. 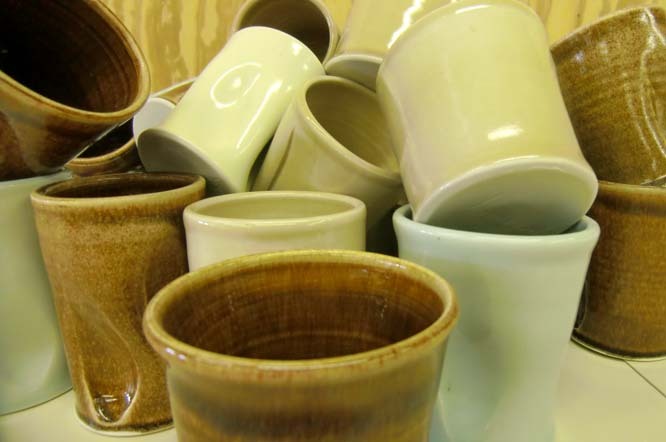 Connie rallied my potter friends and sold my entire stock of work which went a long way in paying my bills. I would not be here without them, I’m sure. Many other friends and family members helped take very good care of me that year. It is too long of a story to tell but I consider myself very lucky to have these people in my life. I am especially grateful to the staff of St. Luke’s Hospital. They saved my life and put me back together. A nurse named John sang to me every morning and a nurse named Caroline kept me laughing throughout the day. The therapists got me back on my feet and everyone from the volunteers to the doctors were so very kind. Three months later, I was able to walk out and go home. I felt genuinely cared for when I was there. When I finally got back into my studio, instead of throwing 50 pound platters on the wheel, I was only able to throw with 1/2 pound of clay. So I sat my little (very little) self down and made 60 cups. 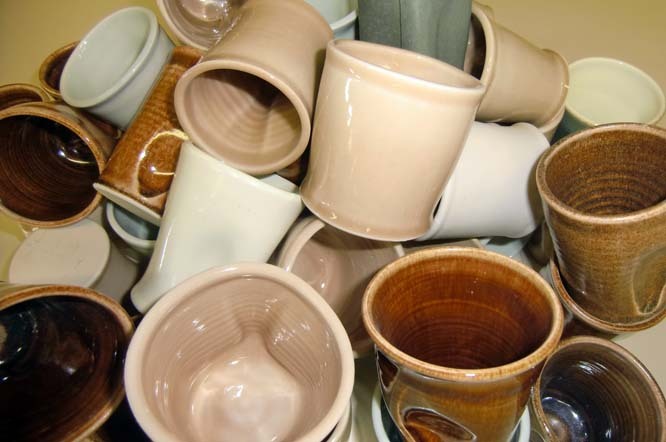 Every year since then, I make 60 cups again because I am forever grateful for the care that I received. I give “hospital cups” to the ones mentioned above. Then I take cups to St. Luke’s Hospital. I leave 25 on the 7th floor where I stayed and I take 25 to the rehab area. I told these people when I left that I would never forget them and I never will. A small cup and a big thank you to my family, friends, and the staff of St Luke’s!